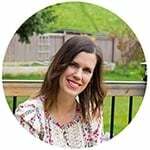 Note: This recipe is part of my 3-in-1 recipe series in which I provide one base slow cooker recipe, and three ways to serve it. See this post to get the instructions for crock pot sweet potatoes. There are so many delicious meals out there that are just ‘off limits’ to busy working families. Lasagna from scratch, roasts, basically anything that takes over an hour is just not happening at my house at the end of a long work day. Previously on that list? 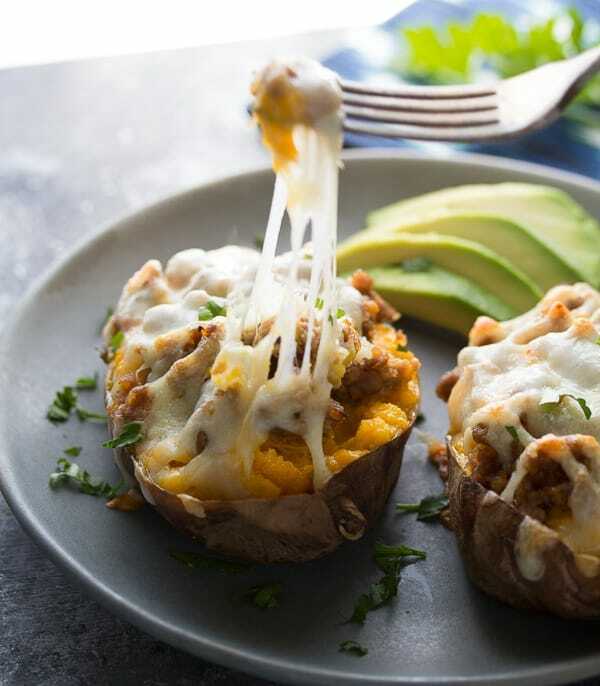 Twice baked potatoes. Who has time to roast the potatoes, let them cool, prep the filling and toppings, and re-bake? Not this girl, that’s for sure. I’m super excited to share this recipe, which is a spin-off from my crock pot sweet potatoes post (recipe here). 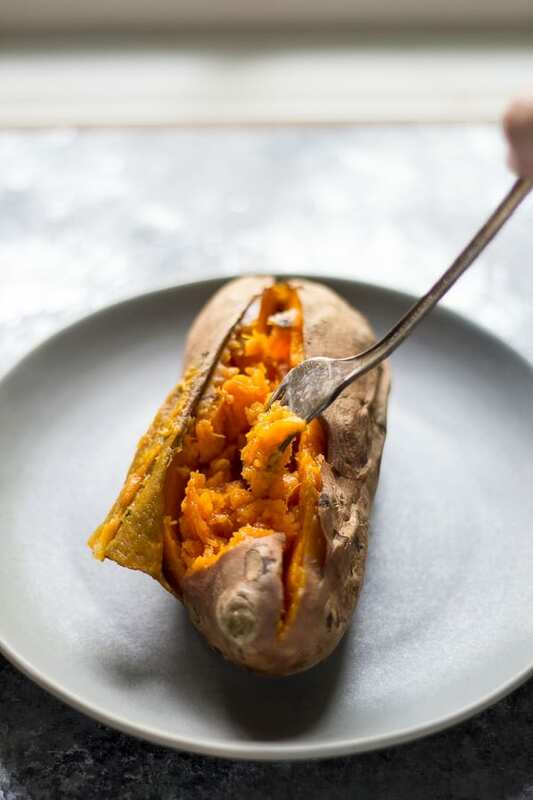 Using this base recipe, you will end up with 3-5 perfectly cooked (and ultra creamy) sweet potatoes. 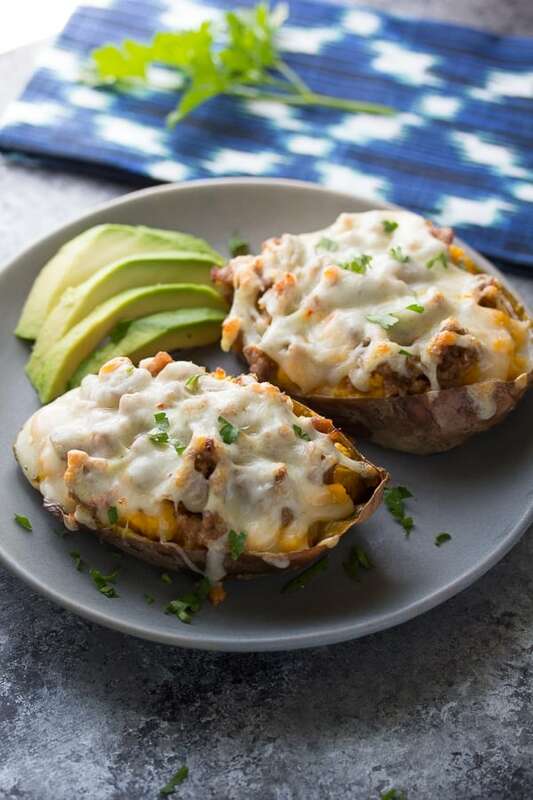 Starting with pre-cooked sweet potatoes makes twice baked potatoes an absolute breeze to whip up. 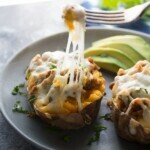 Simply scoop out the filling, mix it up with some spices and Greek yogurt, and gently spoon back into the potato skins. 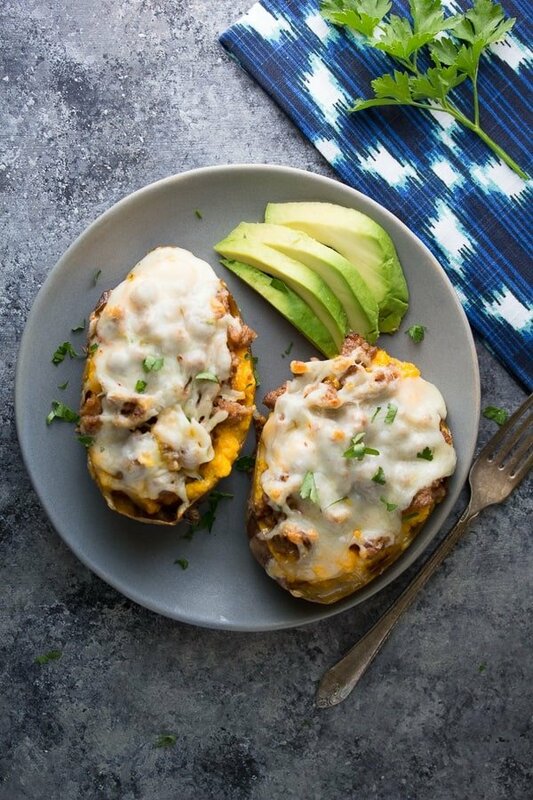 Top with spicy Italian Sausage and pepper jack cheese, bake it up, and you have yourself a healthy and delicious dinner! I actually think it makes a pretty delicious break-fast or lunch, too! 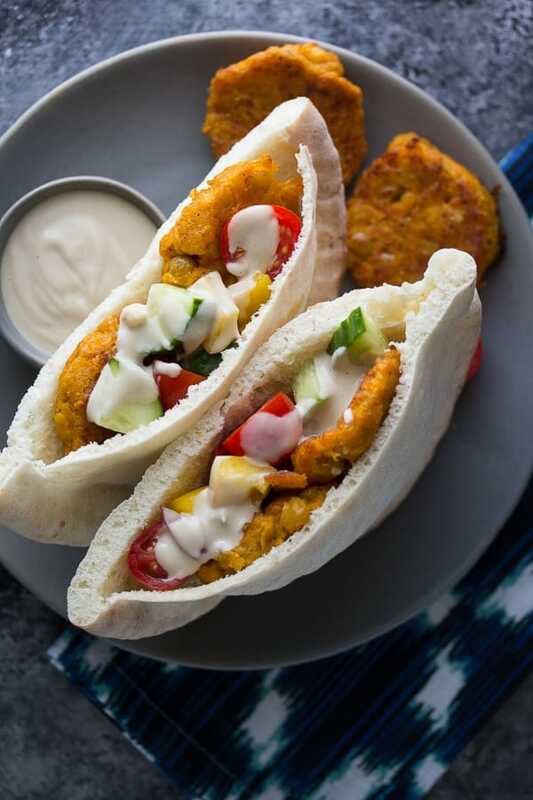 I love your 3 in 1 recipes! Such a time saver have you done one with ground beef? If not I think you should 😉 thanks love your recipes! I am really enjoying the crock pot sweet potato recipes! It’s nice to have a dinner plan for the week. I made the sweet potatoes Sunday, the sweet potato falafel on Monday, and then this tonight. This was so good! My husband and I loved it! I was able to make this fairly quickly, which was really nice. I can’t wait to try the quesadillas next! Hi Mary! I’m so happy you’re enjoying these recipes. 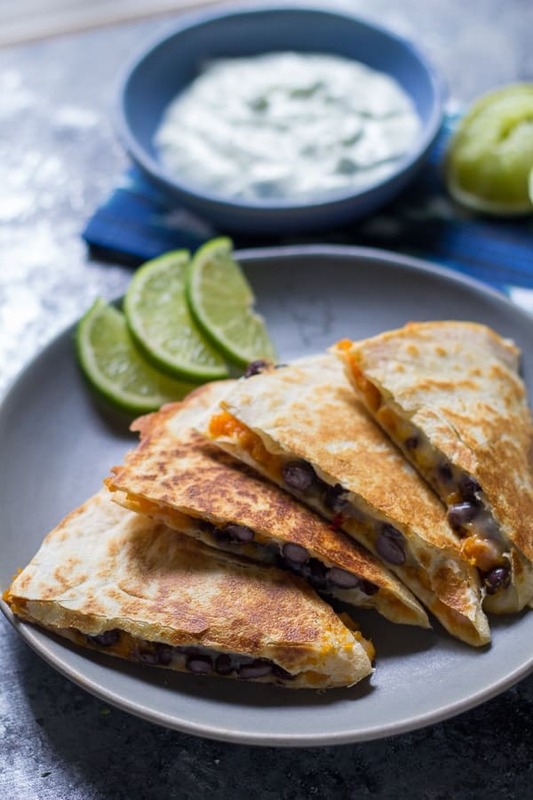 I am a huge sweet potato addict 😀 I hope you enjoy the quesadillas as well!